Who's your longest-term freelance client? Who’s your longest-term freelance client? My friends Lori Widmer of Words on the Page and Anne Wayman of About Freelance Writing hosted a nifty little Twitter confab yesterday, #writingsquared. During the session, I asked the crowd, “Who’s your longest-term freelance client, and how did you acquire them?” One person cited a 19-year relationship that came after a speaking engagement — pretty impressive. My record for loyalty goes back to my second year in business (2000), one of the very first cold calls that I made based on Peter Bowerman’s Well-Fed Writer cold-calling technique. I joked that might be considered a common-law marriage in some jurisdictions, but the business key is that a long-term freelance client relationship can also be amazingly lucrative from the standpoint of referrals. In my case, the business that has spiderwebbed off the original client has been worth well into six figures over the course of time, with no extra marketing effort on my part. In the comments, please share your tale: What’s your record duration for a loyal freelance client relationship, and how did you make the initial connection? And secrets on how you *kept* them as a client? If you haven’t been freelancing for very long, that’s OK! My record, as I mentioned yesterday, is about eight years. They’re a client who came from a referral. An editor I knew, worked for and hung out with at conferences recommended me. They were thrilled because I “got” them, as they put it. I suspect the former writer didn’t do a lot of listening. One of my best contacts is that editor. He’s referred me to several gigs and some I’m still doing years later. It pays to befriend people in the same industry – you get super friendships and they take care of each other. My longest (so far) was about 11 years, with a Fortune 500 web and video client. It was a typical relationship- they found me, we hit it off, we had a lot in common. I impressed them. They also impressed me. Bliss, until they sold the company. Hi Doc. I tend to keep client relationships for a looong time–both relationships with the organizations and with the marketers themselves. I’ve worked with one client for over 20 years–he kept hiring me as he moved from business to business. And for some time, I continued to work for each organization he left as well. I did the same thing with a marketing director at a NYC NGO–I followed her over a five-year period as she moved from one organization to another, then back to the first. And now she just landed a VP position at a third organization–and we’re still in touch. And I still work for the first NGO at which I met her. BTW, the NGO projects started with–wait–a cold call. I hate cold calls as much as the next person. And I doubt they are as efficacious as they were 5-10 years ago. But still: I’ve booked tens of thousands of dollars worth of work with clients whom I first contacted through cold calling. 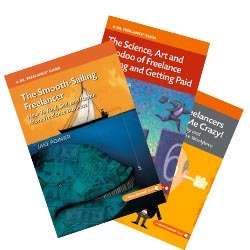 I may have been writing for 30+ years, but I’ve only been freelancing since 2008. My oldest client started with me in 2008 and was my last employer from my Corporate America days. @Lori — it was a lot of fun, just wish I could type faster. Your point about listening is simple, elegant and true. @Patrick, thanks for telling your tale. Even in something as seemingly slow to move as a Fortune 500 company, there’s always flux, eh? @Lorraine, that’s been my experience, too — there’s huge value in befriending nomads! I think of it as the Johnny Appleseed Principle. And the transitory pain of cold calling can eventually lead to pleasure. @Cathy, hey, after the Bruins win, I feel like I’m 4 1/2 again! Good for you in developing a strong relationship that withstood the leap into freelancing. I have other clients tied for longest, but my most lucrative client was a toy company that has an ongoing need for catalogue descriptions. I scored that gig through a copywriting agency that has a lot of big clients, then subcontracts many of its projects to a team of freelancers with various areas of expertise. Thanks to networking and a mutual contact, I was on their radar for about a year before they actually hired me, which I think it is a testament to the fact that networking won’t always bear fruit right away, but when it works, it works. My oldest client is the one who gave me the confidence and the support to leave the corporate world and freelance full time. I’ve written since my college years for pay on a part-time basis, but always thought no one “real” would pay me for my writing. My first client was a contact of mine at my final corporate position. He updated the content on the corporate website. We began chatting about work in general and voila — like a knight on a harley, he swooped down and stole me away from my lecherous boss and gave me work. I work for him still, but have branched out on my own — all thanks to him. He stays at a rate far below all the other clients. I forgot to say how long I’ve had my entrepreneurial Harley riding client — since 2009. @Susan, excellent point about networking and how it sometimes has to marinate a while before it’s ready. @Samantha, what a splendid image! Thanks for sharing your story about how a knight in shining leather got you started in freelancing.